It is not unusual to see minus (insert number) temps in Minnesota during Christmas week. This is one of those weeks. Nothing pairs better with snow, Christmas trees and steak dinners like a big, bold Cabernet Sauvignon from Napa Valley. (Wine is the new black–in this case, black wearable sleeping bag to warm the insides). 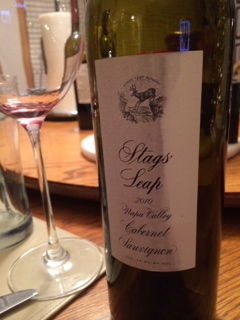 This week the wine was: Stag’s Leap Napa Valley 2010 Cabernet Sauvignon. Stag’s Leap is one of my favorites–maybe because the first time I had it (Artemis) I was on a beautiful veranda eating a great steak dinner with my friend Melissa as we prepared ourselves for a duathlon in the beautiful backyard of Ashburn, NC. The sun was setting, we had the glow of tanned fitness on our faces, and the air was silent. Sometimes, wine is the punctuation that helps us remember those important, quiet times. In this case, Stag’s Leap is a comma, a breath and pause when you want it to go on. This wine, Stag’s Leap Napa Valley, is another marker in a line of great wines. Notes of blackberry, baked black cherry with a drizzle of chocolate on top, slight pepper and smokey hints, it is a big wine that likes to be paired with food. (I loved looking at the leg’s on the glass, thinking this one could debut at Radio City). With 13.9% alcohol and a 2010 vintage, there was also a slight bit of herbaceous undertones–it is a younger wine that might need some air before serving, or perhaps a decanter, as it tipped toward tannin and alcohol right out of the bottle. (My guess is that I would have loved, loved, loved this if consumed on night #2 as it started to open up with time and a bit of warmth.) That said, it was great when it started to open up-and showed a window on it’s potential. It’s a drink now, or even perhaps, wait a bit wine. If you ever see a bottle on sale, as I did with this one (retail $49.99, sale at $35), grab one–just to try your own take at creating a new memory.